We are back from Salzburg. It was a wonderful weekend. 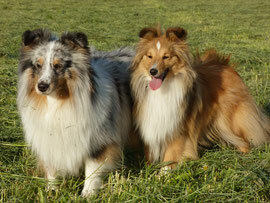 We met good friends and had a nice time at the World Dog Show in Salzburg. We visited the World Dog Show, is it a major dog show with about 19000 dogs of all breeds. Jack and I supported Sabrina and Kelly (Excellent Choice Heart's N soul). Unfortunately Kelly lost her fur two weeks ago but she got a great "excellent". Good girl!! On saturday we visited the World Club Show in Anif and there we met a lot of friends and also Jack's aunt Gibsy (Feeh of Sheltie.Castle). We were able to take nice pictures of Kelly and Jack in the conservation area "Samer Mösl".